Ostectomy - Includes removal of tooth supporting bone in the treatment of periodontal disease. Osseous reconstructive surgery. This involves procedures involving regeneration (regrowth) of lost bone, and the reestablishment of the periodontal ligament, cementum, gingival fibers, and junctional epithelium. An osseous graft is a procedure that involves implanting living tissue or inert material into periodontal osseous defects to regenerate new periodontal attachment (bone, periodontal ligament, and cementum). Donor bone may be obtained from adjacent cortical and cancellous bone, mixed with the patient's blood. Other sources for bone may be from edentulous ridges, extraction sites, or maxillary tuberosity. Bone can also be obtained from tissue banks or various crystalline synthetic substances, such as hydroxyapatite over a 4-6 month period. Grafts may also be placed in osseous defects. A method of tooth replacement involves the surgical implantation of coated metal implants into the bone ridges of edentulous areas (fig. 6-15). The root implant becomes firmly attached to the bone and a new crown is placed upon it to support fixed or removable bridges. The procedures involved in the use of metallic implants require a team approach from the prosthodontics, periodontic, and oral surgery specialties. Figure 6-15. 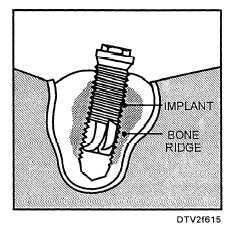 - Implant placement. must be removed. The remaining portion of the tooth can be saved if sufficient periodontal support is present. Endodontic treatment is required before treatment of the remaining portion of the tooth. Root amputation. - The complete removal of one or more roots of a multirooted tooth, without removal of any portion of the crown. Hemisection. - The surgical sectioning of a multirooted tooth through the furcation area so that the blocked, defective, or periodontally involved root or roots may be removed along with the associated portion of the crown. An artificial crown is required on the remaining half of the crown. Bicuspidization. - A multirooted tooth is sectioned through the furcation and both halves of the tooth are retained. During periodontal surgery, the dentist exposes soft tissues and sometimes bone, leaving open wounds. Surgical dressing materials (packs) are usually applied to the wounds as a protective barrier. These packs not only protect the area by preventing food from injuring the surgical area, but also soothe and aid in the healing process. Your primary duty will be to mix the ingredients and form the dressing the dentist places in the patient's mouth. Follow the manufacturer's instructions for mixing. Most dressing will stay in place for 5-7 days. During the postoperative visit, the surgical dressing and any sutures will be removed. The dental officer may elect to place another dressing over the surgical area if the healing process is delayed. Periodontal cutting instruments must be kept sharp by a correct sharpening technique. To be able to recognize when instruments require sharpening is extremely important. To determine if an instrument is sharp, you must be familiar with each instrument's cutting edge(s). Under good lighting, examine the cutting edge using a magnifying glass, or by looking directly at the edge while slightly turning the instrument. A sharp cutting edge will not reflect light and appears as a line. A dull edge will reflect the light, creating a glare because the edge has been rounded off.